I first learned about Dura-Lar during my first meeting with my local chapter of the Colored Pencil Society of America. A woman showed me her work on the film and I knew I HAD to try it (perhaps she should consider being a sales rep for Grafix). Um, to tell you the truth, I don’t know. It’s a film made of some type of polyester (sorry, I know I once worked as a chemist, but my work was more in organic chemistry than industrial chemistry). So, basically it’s a plastic that comes in a big sheet. According to the Grafix website Dura-Lar won’t tear, won’t discolor as it ages, won’t absorb moisture, is acid-free, and is heat resistant (with a melting point of more than 212 degrees Fahrenheit for those artists who are considering taking an internship on Mercury). The surface of Dura-Lar is super duper smooth – something I love. 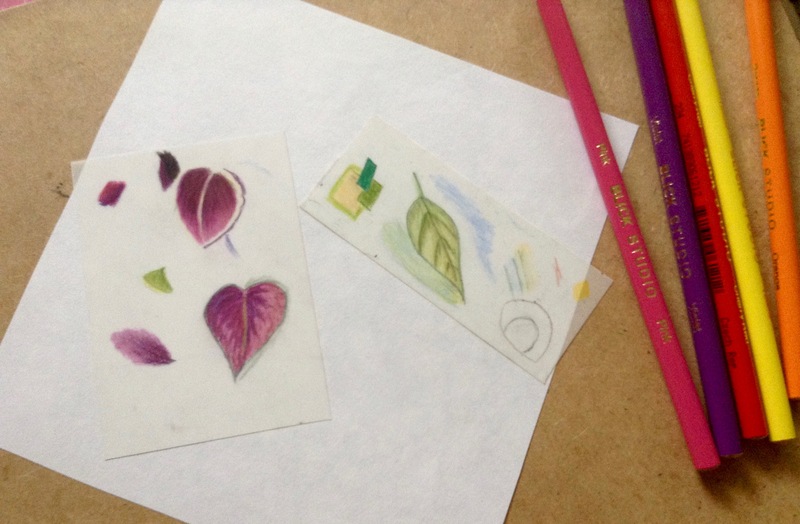 I know some colored pencil artists prefer a substrate with a bit more “tooth” (which refers to the texture of the paper), but for the detailed images I do I prefer a material like smooth bristol that is quite flat and relatively toothless. Which is why I got so excited when I felt the ultra-smooth surface of Dura-Lar. First things first: There are different types of this film, including clear, wet media, and metallized. The one that is best for colored pencils is the matte variety which has a translucent surface on both sides. And yes, you can work both sides. Actually, you may have to work both sides. Due to the smooth surface, Dura-Lar won’t take many layers of color (this is why some artists prefer toothy paper – it allows more layers of color to be built up). The surface of the film only takes about five to seven layers of color, but since it’s translucent, you can flip it over and add a few more layers on the other side to create the depth of color you need. A good approach might be to do your shading on the back side of the film, then work the main colors on the front side. In my first experiments I was surprised at how well the pencil “sticks” to the film. With the surface being so smooth I expected the colors to smear or be easily rubbed off. Nope. Unless you take an eraser to it, the color is going to stay put. However, when you do erase, most of the color does come off well. The one drawback to Dura-Lar (besides it being a petroleum product) is that you have to be careful with your pencil strokes. You can blend and smooth out colors to a small degree, but if you’re not careful to fully cover the area you’re working (especially with dark colors) the work can look messy. 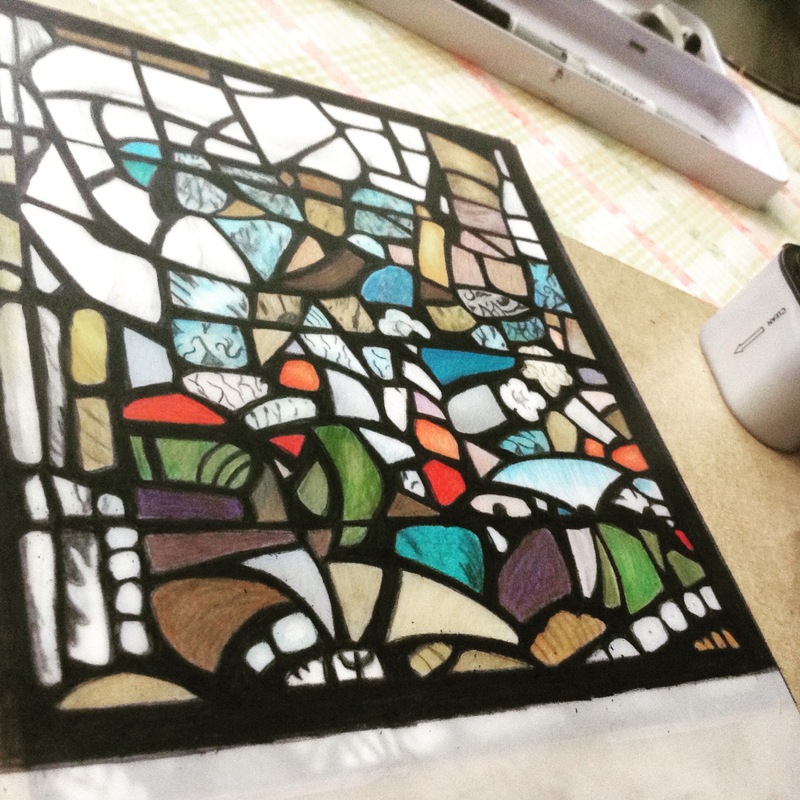 The translucency of Dura-Lar made me think it would be perfect for a stained glass-inspired piece I’ve been wanting to do. I won’t go into details about the reference image in this post, but stay tuned and I’ll tell you all about it once the entire piece is finished. I opted to primarily use my Blick colored pencils on this because, although it’s smooth, the Dura-Lar surface does seem to wear down pencil tips quite fast and I’d rather wear down my least expensive pencils than my uber-pricey ones. The colors, even the browns, turn out quite stunning on the Dura-Lar, although I do feel a bit like I’m drawing dozens of tiny pieces candy. I thought the black outline work might be a challenge to fully cover the translucent film, but so far it’s only taking a couple very heavy layers. I still have two more panels to go on this four-panel series. I can’t say Dura-Lar is my favorite substrate to work on – I like my bristol and even Claybord a bit better. 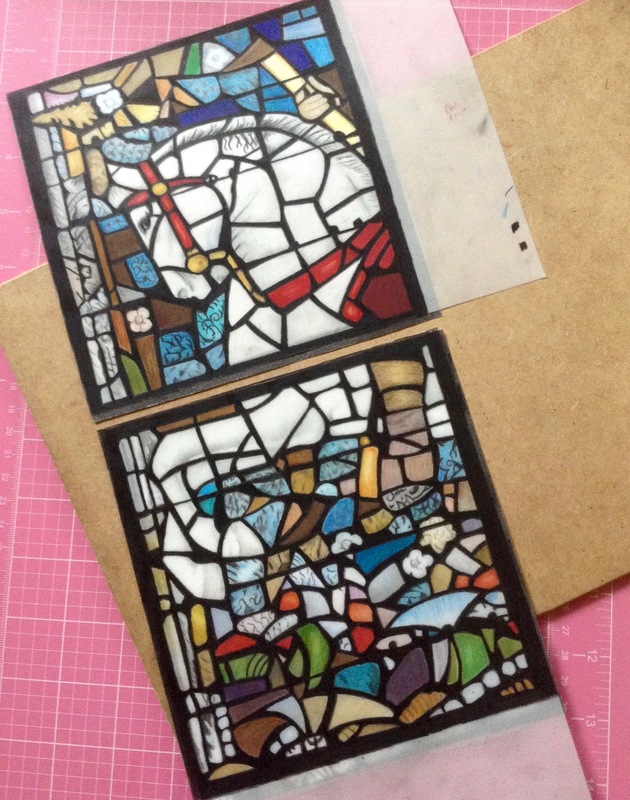 I’m not sure if I would buy more (I have plenty more Dura-Lar left from the giant sheet I bought), but for this project it seems to be a great choice. 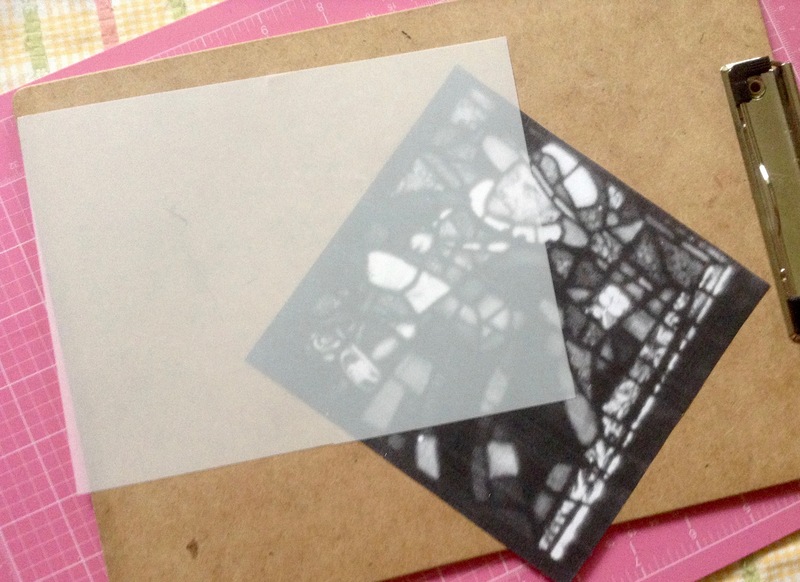 I’d love to hear about any new materials you’ve been experimenting with in your arts and/or crafts this week, so please feel free to toss a comment in the box below. Tammie Painter is the author of The Trials of Hercules and an artist who dedicates herself to the tedium of creating Images with colored pencil. I’ve read about film before but this was the first “up-close” look I’ve had of the material. 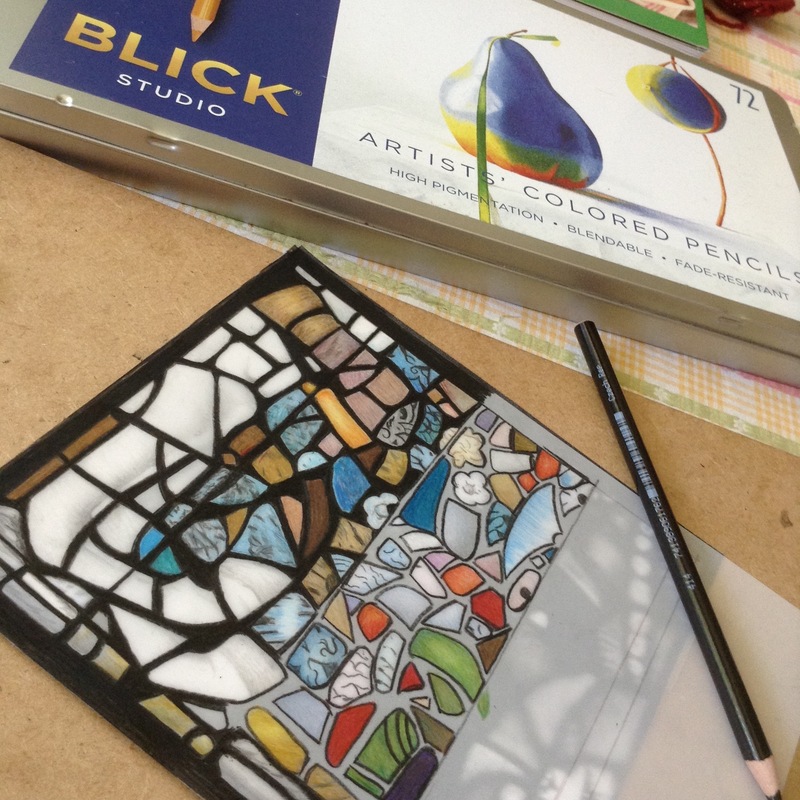 It seems almost perfect for the stained glass drawing you’re doing. The finished work is going to be gorgeous. It does seem to work well for this, although it can’t be viewed like stained glass against a window ☹️ – you need to put white paper behind it or the colors look washed out. I’ve seen some very detailed realistic drawings on the film as well and can’t believe how bright and crisp they look once put against a sheet of paper. Each time I get a new art magazine, I’m awed by all the new techniques and materials available. Oh, for an unlimited art budget! I wish. I have an entire art catalog next to my desk…very dangerous! Luckily, the giant sheet of Dura-Lar was only about $5 and was easy to cut down to several pieces in dimensions I normally work with. Ooh, I just got a small set on the Inktense. Haven’t tried them yet, but I do like the Inktense blocks. Unfortunately, my family still never knows what to get me…sigh. I saw a photo on Facebook — it was around Mother’s Day — with a woman whispering to her husband, and the caption was “Buy me art supplies.” I posted it, and it worked. I got a very nice gift certificate at Amazon with a note to buy art supplies, plus a set of Nupastels I’d been wanting. I’ll see if I can find that picture and post in on my blog one day soon. It’s a handy little hint! I’m going to have to google that image and save it! Let me know if you find it. If not, I’ll scroll through my timeline and then post in to my blog. I’m sure! It’s going to look amazing though… And you could almost make a feature out of trying all these new art materials! I’m really liking this piece! Can’t wait to see the finished product! !